Religious slaughter of animals to produce halal and kosher meat should be banned if more humane methods are not adopted, the leader of Britain’s vets has said. 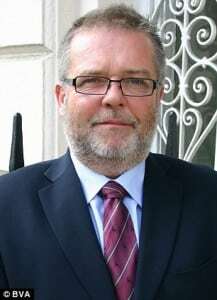 John Blackwell, who took over as president elect of the British Veterinary Association (BVA) last year, claimed killing animals by letting them bleed to death after slitting their throats causes unnecessary suffering. He called on Muslims and Jews to allow the livestock to be stunned unconscious before they are killed. “As veterinary surgeons, it is one of the most important issues on our radar. This is something that can be changed in an instant.,” he told The Times. “The Danish unilateral banning [was done] purely for animal welfare reasons, which is right,” he added, insisting it was not a question of religious freedom. More than 600,000 animals are bled to death in religious abattoirs in Britain every week. Much of the meat produced by kosher and halal slaughterhouses is sold for use in general food supplies, according to The Times. It is believed the European Commission is considering a “modified health mark scheme” to identify meat from animals slaughtered without stunning but Jewish campaigners, who are concerned a new labelling system could be seen as targeting their religious practices, are working with Muslim groups to lobby against it. But Mr Blackwell warned animals were suffering as a result of ritual slaughter, based on ancient religious customs. He said: “They will feel the cut. They will feel the massive injury of the tissues of the neck. Likening the feeling of blood in the windpipe to the pain felt when food is swallowed down the wrong way, he said: “When you check the lungs of these animals there is clearly blood that has been aspirated. It is the first time a veterinary leader has called for an outright ban. The BVA’s has previously stated its opposition to slaughter without stunning but sought practical compromises like improved labelling. The intervention by Mr Blackwell will increase pressure on ministers to act against religious slaughter. Pressure for a ban on religious slaughter without stunning is supported by charities such as Compassion in World Farming and the RSPCA. Most animals killed for halal in Britain are stunned before slaughter but no creatures used for kosher meat are pre-stunned. Mr Blackwell said he wanted a “collective meeting of minds [with religious groups] to review the science” and agree to stun all animals, mainly using a gun to the brain for mammals, and electric shock for poultry. Shimon Cohen of Shechita UK which aims to educate people about Jewish slaughter customs, said bans on kosher and halal slaughter had been designed to drive out Jewish and Muslim populations since the 19th century. He questioned by the Government was only considering labelling religious methods of killing and not including information on non-religious slaughter practices such as shooting, gassing, electrocution and drowning. Halal and kosher slaughter of animals should be outlawed, Britain’s leading vet said today. John Blackwell, president-elect of the British Veterinary Association, has argued the ritual killing of poultry, sheep and cattle by cutting their throats causes unnecessary suffering to animals. But Mr Blackwell, who has been accused of ‘inflaming prejudice’ by religious leaders, says animals must be stunned before the cut because some will be conscious for up to two minutes before death. The Danish government has been accused of religious persecution after it banned the religious slaughter of animals for halal and kosher meat. Despite huge pressure from the Muslim and Jewish communities not to, the practice was banned last month as the country’s Minister for Food, Dan Jorgensen, maintained that ‘animal rights come before religion’. Mr Blackwell said British abattoirs should follow Denmark’s example. ‘Our view has always been that animals should be stunned. They should be imperceptible to pain as death supervenes,’ he told Radio 4’s Today programme. ‘We are looking for a meeting of minds to review the evidence base which clearly shows that slaughtering animals without stunning compromises welfare. If that can’t happen then I would like labeling at the point of sale that gives the consumer informed choice. If that is not possible we would be looking for a ban for killing without stunning. ‘There is no insensibility for these animals by cutting its throat and these remain conscious for seven seconds for sheep and two minutes for cattle and that is not acceptable. As a vet and scientist welfare is top of our list’. Animals that are killed for the Jewish or Muslim markets do not bleed to death. Animals that are killed for the general market or the Muslim and Jewish market are killed in exactly the same way. The Jewish religion focuses on the most humane way of bring death. If you eat meat you have to accept that an animal that is live is then killed and the most important thing to do is to do it humanely. Animal welfare organisations have shown it fails to stun in between nine and 31 per cent of cases. When an animal is mis-stunned it suffers enormous pain and distress. When you eat your chicken from the supermarket you need to know it has been carried by an industrial conveyor belt and dumped in a bath of electricuted water. We don’t do that and we wouldn’t. ‘In Denmark you had a political act designed for populist reasons because of prejudice against Muslims and I am worried Mr Blackwell is speaking in ways that inflame prejudice. Mr Blackwell said the way halal and kosher meat is created, through the throat being slit, resulted in ‘five or six seconds’ of pain for the animal. ‘They will feel the cut,’ he said. ‘They will feel the massive injury of the tissues of the neck. They will perceive the aspiration of blood they will breath in before they lose consciousness. More than 6,000 animals are killed in religious abattoirs every week in Britain. The halal meat market is believed to be worth up to an estimated £2billion. Charities including Compassion in World Farming and the RSPCA also support the move to ban the slaughter of animals without stunning first. However, it is feared far-right groups could use Mr Blackwell’s comments to support their campaigns on the issue. Lewis Grant, of the Veterinary Public Health Association, said cuts left over from animals which have been slaughtered for halal and kosher meat often enter the general meat trade and people do not realise they are eating it. The Jewish practice of slaughtering animals is known as shechita. Shimon Cohen, of Scechita UK, said if the government labelled meat which had been slaughtered for religious reasons it should also inform consumers if their meat had been ‘shot, gassed, electocuted or drowned. He also said banning the religious slaughter of animals had been a way of driving out Jewish and Muslim populations in the 19th century. Last week the Danish government was accused of being anti-Semitic after passing the law which banned the religious slaughter of animals for halal and kosher meat. The change has been described as ‘anti-Semitic and ‘a clear interference in religious freedom’ by a group petitioning against the change. Under European regulations, animals are required to be stunned before slaughter unless an exemption can be found on religious grounds. Animals must be conscious when killed for the meat to be kosher under Jewish law and halal under Islamic law. According to the laws, in order for a meat to kosher it must come from an animal that means the kosher rules. Before slaughtering, the animal must be healthy and uninjured and a sharp knife is used to slice through the main arteries and windpipe, causing a drop in blood pressure that causes the animal to lose consciousness. Jews believe this is a way of killing that shows ‘respect and compassion’ as set out in Jewish law. Nick Clegg has said he is “emphatically” opposed to the UK introducing a ban on the slaughter of animals in compliance with what some see as religious requirements. Slaughter of animals for the production of halal or kosher meat is currently exempt from UK regulations requiring animals to be stunned into unconsciousness before having their throats cut. Clegg was answering a question on his weekly LBC phone-in, prompted by a recent ban on such slaughter imposed by the Danish government, where agriculture minister Dan Jørgensen supported a ban on the basis that “animal rights come before religion”. No government of which he was part would support this, he says. He says he supports the right of Jewish and Muslim communities to decide how animals are slaughtered. That is an important liberal position, he says.